John’s account of the resurrection is a mysterious predawn story which sheds wonderful light wherever it is told. It is full of life but also full of curious human and material detail. It puts pictures in our imaginations rather than ideas in our minds. That is why artists have found it so inspirational. The preacher must talk about it, of course. But there are ways of talking that also paint pictures. Maybe the preacher’s task at Easter is to paint a picture so that people can really see. Early on the first day of the week, while it was s till dark, Mary Magdalene came to the tomb and saw that the stone had been removed from the tomb. 2So she ran and went to Simon Peter and the other disciple, the one whom Jesus loved, and said to them, ‘They have taken the Lord out of the tomb, and we do not know where they have laid him.’ 3Then Peter and the other disciple set out and went towards the tomb. 4The two were running together, but the other disciple outran Peter and reached the tomb first. 5He bent down to look in and saw the linen wrappings lying there, but he did not go in. 6Then Simon Peter came, following him, and went into the tomb. He saw the linen wrappings lying there, 7and the cloth that had been on Jesus’ head, not lying with the linen wrappings but rolled up in a place by itself. 8Then the other disciple, who reached the tomb first, also went in, and he saw and believed; 9for as yet they did not understand the scripture, that he must rise from the dead. 10Then the disciples returned to their homes.11 But Mary stood weeping outside the tomb. As she wept, she bent over to look into the tomb; 12and she saw two angels in white, sitting where the body of Jesus had been lying, one at the head and the other at the feet. 13They said to her, ‘Woman, why are you weeping?’ She said to them, ‘They have taken away my Lord, and I do not know where they have laid him.’ 14When she had said this, she turned round and saw Jesus standing there, but she did not know that it was Jesus. 15Jesus said to her, ‘Woman, why are you weeping? 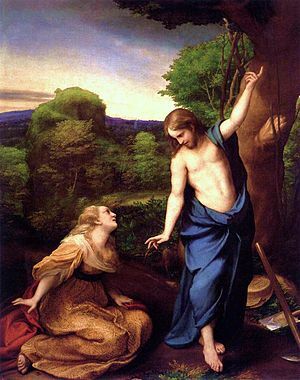 For whom are you looking?’ Supposing him to be the gardener, she said to him, ‘Sir, if you have carried him away, tell me where you have laid him, and I will take him away.’ 16Jesus said to her, ‘Mary!’ She turned and said to him in Hebrew, ‘Rabbouni!’ (which means Teacher). 17Jesus said to her, ‘Do not hold on to me, because I have not yet ascended to the Father. But go to my brothers and say to them, “I am ascending to my Father and your Father, to my God and your God.” ’ 18Mary Magdalene went and announced to the disciples, ‘I have seen the Lord’; and she told them that he had said these things to her. ‘She ran’ v 2. ‘The two were running together’. v 4 These are two of the very few references to running in the New Testament. The father of the prodigal son also runs to meet him. What does this running tell you? What makes you run? ‘Then the disciples returned to their homes.’ v 10 This sentence often comes across as the biggest anti-climax in the gospel. But then we often forget that Jesus’ mother Mary would have been at the home of the beloved disciple. Do you read this going home as anti-climax or as an important part of the narrative? Why might they have gone home? ‘Do not hold on to me’. v17 These poetic and mysterious words of Jesus to Mary, ‘noli me tangere’, have inspired many artists. They can also touch our imaginations. It is about being close – but not coo close. It is about sustaining spiritual desire – but not quite satisfying it. It is about the not-yet-accomplished nature of our discipleship. How do you picture this scene? How do you deal with the restraint implied? ‘I have seen the Lord’. v18 It is Mary Magdalene speaking to the apostles. This is why she is called ‘the apostle to the apostles’. She is the first evangelist. And notice that she uses the word ‘seen’. Seeing is a primary and spiritual way of knowing. Who was your apostle? To whom might you be an apostle? Who needs to hear your testimony?